Salar, the leaper! Surging, struggling, striving, braving currents, rapids and falls, he succeeds against immeasurable odds to reach that final destination in his natal stream; that final pool where he will complete nature's gift, the perpetuation of his kind! This is the vision we all share for this mysterious and marvelous fish of the fresh and saltwater world. Yet, less than a decade ago this vision was limited to those with an intimate relationship with salmon. To others, salmon were simply 'fish', one of nature's resources which would always be there! However, thanks to numerous educational programs we now know otherwise. Today we are aware of the importance of this very special Pacific Northwest natural resource. We know that fish in their natural environment are the barometer of water quality in our streams, lakes, and oceans. We now have come to recognize just how fragile is the aquatic environment which for so long we have taken for granted. Much of the change in our public attitude can be attributed to that new leisure activity which can best be described as SALMON WATCHING . 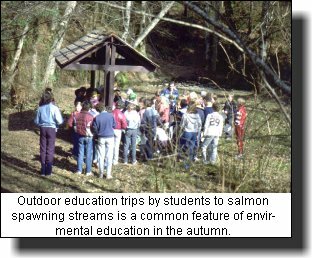 One does not have to be a commercial fisherman or even a sports fisherman to be an active SALMON WATCHER . It has become a summer and autumn pastime, now common throughout the Pacific west. 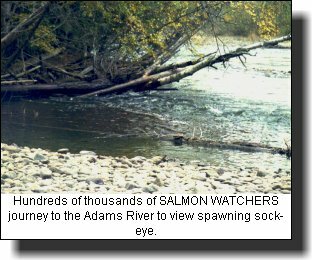 British Columbia SALMON WATCHERS are fortunate to be able to be able observe all five North American Pacific salmon, the Chinook , Coho , Sockeye , Chum , and Pink salmon. 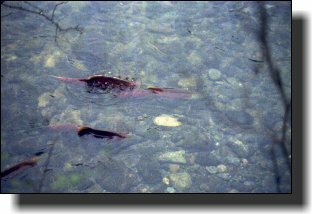 These are the salmon which are returning to their home or natal stream, following an epic North Pacific odyssey, to spawn and complete that final stage in their life cycle. 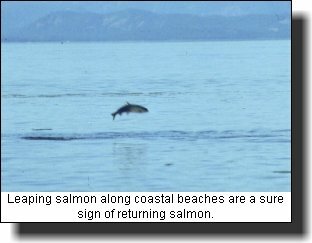 When you walk along the numerous park and fishermen's trails that are now common along most populated coastal and interior rivers, or, while you are at the estuarian beaches, look for this specific salmon behaviour. Leaping salmon in shallow water. This is a common sight in August and September. These are adult fish acclimatizing themselves to the taste of their home stream's fresh water. Scientists are now speculating that this leaping behaviour could be a process of reverse imagining whereby, like a film running backwards from the images they captured when they were juveniles, they are leaping to locate their particular spawning stream. 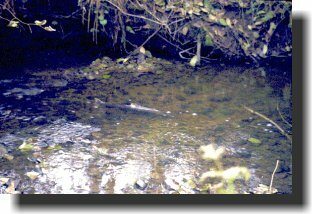 To see a spawning salmon in the stream look for white flashes underwater that persist in one location. This is the female or 'doe' salmon turning on her side to dig the redd. She selects the spawning location and prepares the redd while the male, or 'buck' fights off other males who wish to take his place beside the female when she is ejecting her eggs. 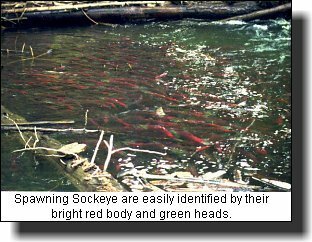 A salmon redd is a depression created by the upstroke of the female salmon's body and tail, sucking up the river bottom gravel and using the river current to drift it downstream. The female salmon digs a number of redds, depositing a few hundred eggs in each during the one or two days she is spawning. 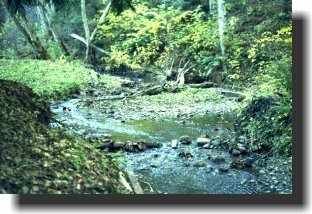 Each redd is located immediately upstream from the last to allow the current to deposit drifting gravel on top of and covering the previous redd. Redds are very obvious in the stream, visible by clean exposed white gravel. Salmon spawn between 2000 and 6000 eggs, depending upon species. Different sized gravel is used as redd locations by each species. 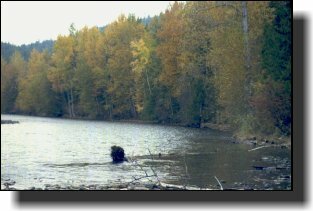 The larger salmon, chinook, spawn in the coarser gravel and the smallest salmon, pinks, spawn in the finest gravel of the river bottom. The other species spawn in gravel and locations between these two. Taking a tip from sports anglers, SALMON WATCHING can be greatly improved if you wear polarized sunglasses. Polarization cuts the light refraction on the surface of the stream, that glare which is so familiar, and gives an unhindered view of the fish. You should use these polarized glasses whether it is sunny or loudy (yes, even while it is raining) for, as sports anglers have found, during daylight there is always a glare from the water surface. For some yet unexplained reason dogs love to roll in the rotting carcasses of dead salmon! There is something, like the known appeal of catnip with our feline pets, that dogs cannot resist. As one who has used much tomato juice in an attempt to wash the lingering smell from my pet, I can only recommend that you make certain in that you walk your dog with a leash when you are SALMON WATCHING on the riverbank. 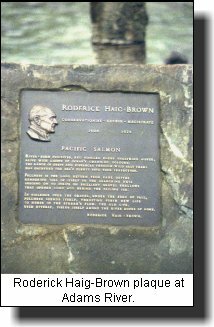 The fact that all Pacific salmon die following spawning is often looked upon as a considerable natural waste. Bleached carcasses lining the river beaches appear to serve no purpose other than to feed occasional predators and scavengers like eagles, bears and seagulls. However, nothing could be further from the truth! 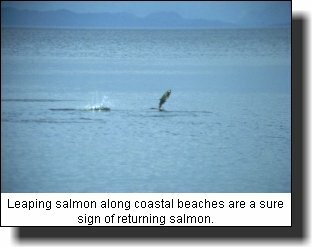 The decomposing salmon provide incredible riches in nutrients for the many aquatic organisms that are totally dependent upon these for their unique life cycles. Many of these aquatic organisms provide the basic food for the young salmon while they live in the river during the fry stage of their life cycle. As well, these nutrients give the aquatic environment the necessary minerals required for plant and animal growth in our otherwise rain leeched coastal watersheds. 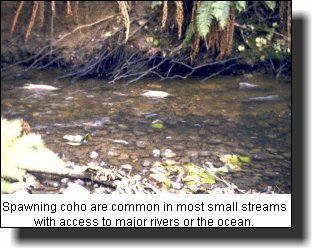 It is interesting to note the overlapping of various species when they are most prominent in their home river systems. These different spawning times are one of nature's ways of dispersing the various species so that they do not intrude on those eggs which have been spawned by a previously spawning species. Evolution has also carved specific spawning behaviours for every species to ensure that there is a minimal intrusion on each others. 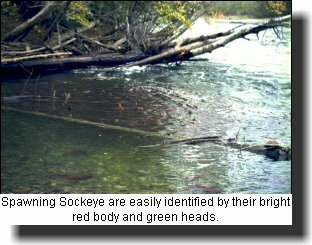 Sockeye salmon tend to spawn in river waters close to a lake where the fry will migrate when they have hatched. 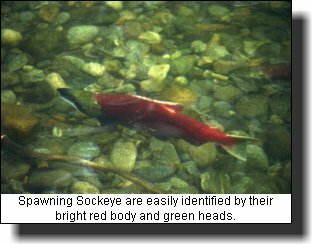 The Sockeye fry will remain in the lake for a year before they migrate downstream to the ocean. Pink salmon will tend to spawn in the lower reaches of rivers. Pink fry migrate to the sea almost immediately that they swim up out of the gravel. Chinook salmon will normally spawn in the upper reaches in the main river. Their fry will spend three months to a year before they head out to sea. 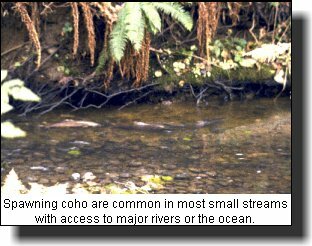 Coho salmon will search out the smaller creeks and tributaries to spawn. Here, their fry will usually live for one and a half years before they migrate to sea. 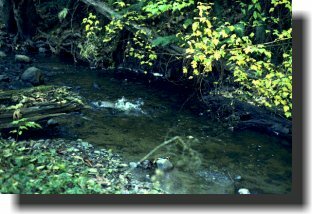 Chum salmon will spawn in the main river and, like Pink salmon, Chum fry will migrate to sea immediately that they reach the fry stage. Many birds and mammals take full advantage of the 'time of plenty' when the salmon spawn. SALMON WATCHERS will usually see many birds and often shy mammals as they feed on spawned salmon in the rivers. SALMON WATCHING provides a great reason to visit the vast B.C. outdoors during the summer and autumn. It is an opportunity that is available in over 10,000 B.C. rivers and streams. Check with your local Fish & Wildlife office or Department of Fisheries office or hatchery to find the best time to SALMON WATCH in your region.